There were 2 main waterfalls that you have to find a way around. The first one I climbed up a easy looking rock step on the left hand side which turned out to be a pretty sketchy route and one I wouldn't recommend. The second waterfall I headed up the bank on the right hand side. There were heaps of blow downs that I had to fight through which was pretty tough but eventually got through it and rejoined the creek. These are the only 2 tricky sections the rest of the assent is just rock hopping and scrambling up the creek to the saddle. its a beautiful walk up the creek and a good change from always climbing on ridges. Great, sounds like a worthwhile track to tackle. Your route description reminds me of Egan Creek, which I very much enjoyed. With any luck there won't be any more rain this week and I can give it a shot next weekend. Went up SE ridge today, someone's left a rope around the tree down wave rock. Parts of the slab were a bit wet so it definitely speeded up our ascent! QPWS were also doing visitor surveys when we got back down. Interestingly their "mark today's route on this map" part of the survey form only included SE and S ridges. Champion_Munch wrote: Still climbing mountains into your 70s Nungulba, that's incredible - I hope I am still able to summit Barney at that age! A query for experienced Barney walkers: for my next trip, I am thinking of heading up Barney Gorge, across to West Peak and then down Midget Ridge. Is this actually achievable in a day, or am I really pushing it (starting from car park)? For comparison, the other routes I've done have taken: SE/South 6 hrs; SE/Egan Ck 9 hrs; North/South 8 hrs. I usually start walking around 7-7:30am, so with sunset after 5:30pm that would give me 10-11 hours of light, perhaps a little more if I started a bit earlier. The route would be entirely new to me past the Lower Portals, and I've read that midget ridge is fairly scrubby so not quite sure how long the descent would take. I really enjoyed Egan Creek and would like to explore more of the western areas, particularly the gorge. I imagine that if Barney gorge takes longer than anticipated I could bail out and just head back down the south ridge and back along the roads, but it would be nice to get up to West Peak for once. Hopefully (health permitting) there will be another Barney pilgrimage next winter. Looking at repeating a walk I did in the late 60s - a sort of "variation" of Logan's - which avoided the tricky bits by detouring right (away from the East face) as required. I was carrying a pack so couldn't have been too bad!! A short chimney at the top, as I recall? The main advantage of the Eastern approaches to Barney is that you don't have lengthy "walk-ins" to the start of the climb proper. This is a hobby project, going for something with the resolution of a Garmin Gecko, with functionality closer to eTrex Legend. This was the first test outdoors, and I have certainly been fitter! Interesting that you say that, reminds me of something I came across recently - posted by Quasymody, a Barney veteran who posts photos on Flickr and also includes some historical tidbits from time to time. Interesting to read through comments on this newspaper article of an ascent in 1918: https://www.flickr.com/photos/51979177@ ... 4372408777. Emphasis mine. The trio climbed up 'the Great Gorge' (ie. Rocky Creek - which appears to have been the common ascent route until the 1950s)...from there they headed off to climb West Peak, where they found the cairn erected by Milford school teacher H.W. Johns and others in 1904, along with a brass name plate left by H.W. Johns, R.A. Wearne and Michael O'Connor in 1910. On the way down West Peak, Gaylard then made off alone for East Peak, whilst the others made their way over to the East/North Pk saddle. After climbing East Peak, Gaylard rejoined the others at the East/North Pk saddle and they returned via Rocky Creek...not quite making it out of the creek by nightfall...whereupon they waited until 8.30 for the moon to rise, eventually returning to Lilydale at 11.00PM! A couple of weeks ago I went in for another Barney adventure, up Barney Gorge to West Peak and down Midget Ridge. Thanks to Drazah for the tips on Gorge times/route. From Portals carpark it took 6 hours to West Peak, and then another 6 hours back down to the carpark - so a very long day in the end. No difficult climbing moments on this route, just long and tiring. The hardest 'climbing' moment was in negotiating the final cliffs high up on west peak. Rather than take it direct, I moved further to the south, where the cliffs thinned out - here there was a serious drop immediately below, so no room for errors! Probably the most 'exposure' I've come across on Barney so far. If heading back down to the saddle, it might be easier to descend Midge Ridge initially and then contour back around, though this would add more time. I followed notes from the Take A Walk guidebook for ascending the Gorge, which was pretty much spot on. The detour at the first major waterfall took considerably longer than I expected, through thick bush around the cliffs at the right. It might have been quicker to detour further west and avoid some of the steep, scrubby sections I climbed through. The Gorge itself was very pretty, although very hot as it opens up directly towards the morning/midday sun. I wouldn't be keen to try this any later in the year, except perhaps as a down route in the afternoon when the sun is more obscured. To my surprise there were excellent views between West Peak and Midget Peak, despite what I've read elsewhere. Lost quite a bit of time and energy in locating the cliffbreak at the knoll below Midget Peak and ended up on a bash through rough bush and over some questionably steep and sloping slabs. Rest of the ridge was straight-forward. By the time I was back at the Barney Gorge campsite, it was getting close to sunset time. I spoke to some campers (surprisingly, the only people I saw all day) who were really lovely and offered me some crackers and dip. 'Bob' seemed particularly knowledgeable about the Barney and the Rim, and later I wondered if perhaps I had unknowingly bumped into Mr Rankin, from Secrets of the Scenic Rim fame... seemed about the right age and all. Coincidentally, I had been thinking about Rankin's 'Barney all-peaks' epic throughout the hike, and later realised it was the same day 34 years later. It was dark by the time I was back at the Portals, and getting back to the carpark took twice as long as it had going the other way in the morning. Wouldn't attempt this route in a day again, unless I was starting/ending at the Gorge campsite - it's simply too long and tiring for a mere mortal such as myself. I was horribly nauseous during the last hour and far too exhausted to enjoy the 'easy' walk out. Later realised I had drank in excess of 6 L water during the day, which might not have helped... next time I will bring electrolytes! Thanks for the memorabilia - nearly 100 years ago! I'm afraid I can't compete with that!!! "It was intended that the article on flora would be written by Mr Lindesay Smith, Senior Botanist with the Department of Primary Industries. Mr Smith visited Mt Barney on 12th September, 1970, to collect specimens for this article and while in the upper reaches of Rocky Creek, he collapsed and died." Hey, I'd like to add a quick note about my trip up North Ridge yesterday - decided to do that one after reading this thread. I'd previously done South and SE ridges without too many problems. The ridge itself wasn't too difficult to follow - I used the trail notes from bushwalking australia and found them largely accurate if not always thorough. Had to duck under a gate with a 'no trespassing' sign for the Logan's access - not sure if this has always been there? Once on the ridge itslef there were some reasonably sustained segments of rock scrambling on par with Mt Tibrogargan / Beerwah and some reasonably steep gullies to ascend, but nothing I felt I needed a rope for. Good views until cloud engulfed us about 3 quarters of the way up. It took us about 6 hours to reach North peak from Yellowpinch (left at 630 am). We had initially planned on descending Rocky Ck, but it looking pretty steep. Taking into account the recent rain, our lack of familiarity with the route, and relatively amateur rope skills, we made a change of plan and decided to trek down to the main east-west saddle and descend SE ridge. This was very tough going and took much longer than expected due to the difficultly of the terrain and thickness of the underbrush - we ended up tracking quite far down the saddle and had to work our way back up past the falls of Barney creek. We were very relieved when we arrived into the Rum Jungle at 3.30, about 3 hours after leaving North Peak! Descent was uncomplicated from there, the track up Peasant's was looking quite eroded following the recent rain though. Strolled thankfully into Yellowpinch, arms raised, as the last of the light left the sky at 6pm. 3/ Take good wet weather gear - I definitely had inadequate gear and me and my bag were thoroughly soaked from the many hours spent in cloud at the summit. If I'd had to spend an unplanned night there I would have been freezing cold. Good rain jacket and waterproofed bag are a must even with minimal rain forecasted. Hope this helps anyone planning North Ridge! Yesterday I was pretty convinced I wouldn't do another Barney trek for a fair while but I think it won't be too long before I get the itch again. billiamda wrote: Hey, I'd like to add a quick note about my trip up North Ridge yesterday - decided to do that one after reading this thread. I'd previously done South and SE ridges without too many problems. What an adventure! Good one. Yes, as Cams said, a "ripper" of a report! Mt Barney seems to be in danger of being over-run by scrub/undergrowth. I noticed same last year, when I returned after an absence of forty years. Don't know whether Parks & Wildlife should look into this as even the "easy" routes can be a challenge, especially on the upper flanks of the mountain, where there have been serious bushfires in recent years. It's getting to the stage where Logan's is beginning to look an easier proposition than some of the lesser ridges!!! Was back at Barney again last week... up SE and down North, lots of fun! I got to thinking on the way down that I'd like to give Rocky Creek a go next time I'm there. wokket gave some good tips on how to use a rope in this thread, but I'm not sure what kind of rope I should take, and where would I get it from? Any help would be appreciated. Champion_Munch wrote: Was back at Barney again last week... up SE and down North, lots of fun! I got to thinking on the way down that I'd like to give Rocky Creek a go next time I'm there. wokket gave some good tips on how to use a rope in this thread, but I'm not sure what kind of rope I should take, and where would I get it from? Any help would be appreciated. They will be able to give you advice on equipment selection too. To use for actual abseiling something like 8mm cord or dynamic climbing rope would probably be good. If just pack hauling you could go thinner or use tape/webbing. Either way climbing shops are the place to go for this type of equipment as well as good advice. Like Pinnacle, or K2 in Brisbane. 9mm static rope (some call it cord) available K2. Static for abseiling, dynamic for rockclimbing. However I carry 12m of 25mm tubular tape for 'rope-assisted descents' eg steep slab of wet rock. Tape (some call it webbing) is lighter, more flexible and easier to pack but has a shorter life, also available K2. Some years ago I did abseiling courses with the Queensland Wilderness Adventure Club in Brisbane (for some reason it is part of the Adventist Church but religion or belief plays no part in the courses and anyone can attend). They have a web site but it now appears inactive, needs a phone call to see if they still hold courses. For a simple 'rope-assisted descent' to get past an obstacle such as the Rocky Creek waterfalls, Google search for 'classic abseils' which really means older abseiling techniques that only needed rope, not all the equipment that is used now. However for safety you must use all the right equipment (and a longer rope!) when the abseil is bigger and/or vertical. Check the 'Classic Abseil' technique on page 11. Your rope is looped around tree or boulder where you are descending from so that you can pull the rope down at the end of the descent (That meant my 12m tape could only get me a 6m descent. Sufficient for most obstacles.) Nothing other than rope or tape needed. ....And you can bypass the Rocky Creek waterfalls; climb out of the creek on the southern bank and go up through the scrub a few meters to be right at the base of the cliff-face and continue at the base until past the waterfalls. 2/ Off-route travel can be seriously slow going. I well remember that hike. Aug. 2013. The bush bash from North Peak to West Peak took a good toll of the three of us. Never again. I heard Midget Ridge is even worse, the whole thing is a scrub torture in hell .One I'll never do. Off to Mezzanine in a couple of weeks and then later hikes: Eagles and Long Leaning to complete Barney adventures. So far Short Leaning has been the most fulfilling hike I have done in Australia by far. A real pleasure of a hike. I hike alone so only do Logans, SE and Peasants. I find SE the easiest, up and down, Logan is easy going up and you can find places to avoid the steep dropoffs, and it's not difficult to find the route (follow the ridge:-)) but I don't go down Logans. I don't like Peasants at all, but that's just me, most people find it the easiest. Hint, if you are doing the SE/Peasants Loop, take a mountain bike and a bike lock and leave it before you go up SE. After 8 or so hours of walking, cycling the fire trail back to Yellow Pinch is much easier than walking. Also, on Barney, I always download gpx tracks of the routes (from Wikiloc) and put them into ViewRanger, so if you think you are getting lost, you can check your position on the GPS. If anyone is a bit unfit/nervous about Barney, I recommend Mt Maroon, which has spectacular views and is an easy walk with only a little bit of scrambling. Takes me about 3 to 4 hours up and down, with a half hour on top to have lunch. Easily one of my favourite walks in SEQ. 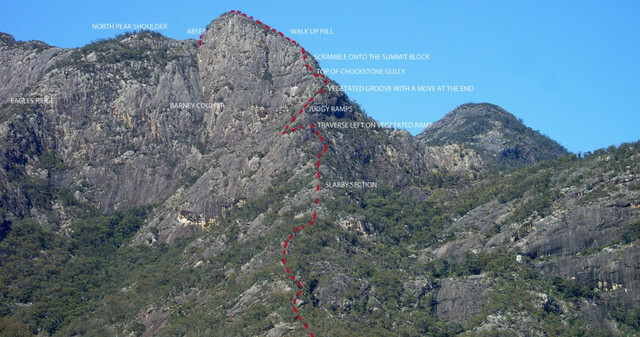 One of the more strenuous day walk routes is Lower Portals, Barney Waterfall, Barney Gorge, South Ridge, Yellow Pinch. You will need a car shuffle and it's a long day but a great day none the less. I'm planning on camping up there in the next few days, did you see if there was any water in the small creek between the E & W peaks by chance? I'd have perhaps called it sketchy during the 15 yrs drought we had not so long back. It really hasn't been dry enough lately to be completely dry. I'll be heading to RC next month or so (on the way down from the North Ridge). I have never hiked that creek before but I'm aware people bypass the 25m waterfall without a rope. I was wondering if you could provide details of how it is done. ...could provide details of how it is done. On descent and when you get to the waterfall climb out of the creek on the southern (RH) side and go through the bush a few meters until you get to the base of a vertical rock cliff. Staying against the cliff base turn left and descend - it's steep but that's all - until past the waterfall and then return to the creek. You might see tracks worn by others taking the same route. Thank you! Your advice is going to save me a headache and time trying to figure out how to tackle the wf. Has anyone done a traverse from 1/2 up Short Leaning Ridge over to Eagles? Where exactly are the Moonlight Slabs located on this photo? Thanks tomh. It would be pretty much an exploratory walk as I don't think too many people venture into that area unless is to climb LP's north face. I suppose the traverse I'm planning to do can be quite messy, fingers crossed the bush overgrowth isn't excessive.